Hello families in the Georgian Bay Biosphere Reserve! This is where you will find posts about all the awesome things people are finding in the Biosphere, cool pictures, answers to your questions, information about events and much much more! Have you ever heard of the Canadian Shield? The Canadian Shield is the name for a large area of exposed bedrock. 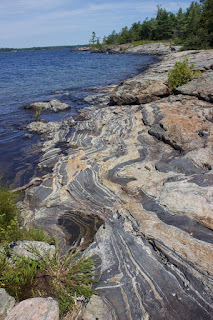 The Georgian Bay Biosphere Reserve is on part of the Canadian Shield, which is why there are such interesting and unique landscapes! 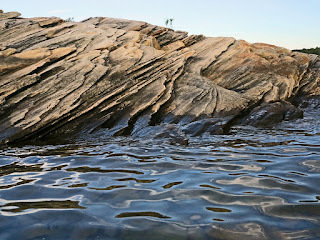 Rock formations and landforms like the ones in these pictures are typical of the Canadian Shield. The story of these rocks starts a long time ago. Over one billion years ago (that’s 1,000,000,000 years!) this area was covered in tall mountains called the Grenville Mountains. But where did they go? The mountains were worn down to their current level through a process called erosion. Erosion is when wind and water wears small pieces of rocks away. Over time if a large rock is eroded, eventually the rock will shrink. This is what happened to the mountains, they slowly became small bumps and hills due to erosion from wind and water. Water can smooth rocks down in two ways - one way is the liquid water rubbing off small pieces of rock called minerals, another way is by ice. Large sheets of ice called glaciers once covered Ontario. These glaciers were like gigantic ice cubes one kilometer high! Due to the glacier's weight and slow movement, the ice carried away a lot of rock and soil, exposing and smoothing out the bedrock into what it looks like now. What is the Canadian Shield made of? The Shield is made of hard rocks like granite. However, Eastern Georgian Bay is made up mostly of gneiss (pronounced ‘nice’). 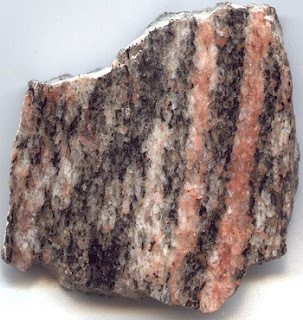 Gneiss and granite are similar, but gneiss has bands or stripes in it. When you take a close look at rocks you can often see that they are not all one colour. Rocks may have different colours or spots that are shiny where other spots are dull. 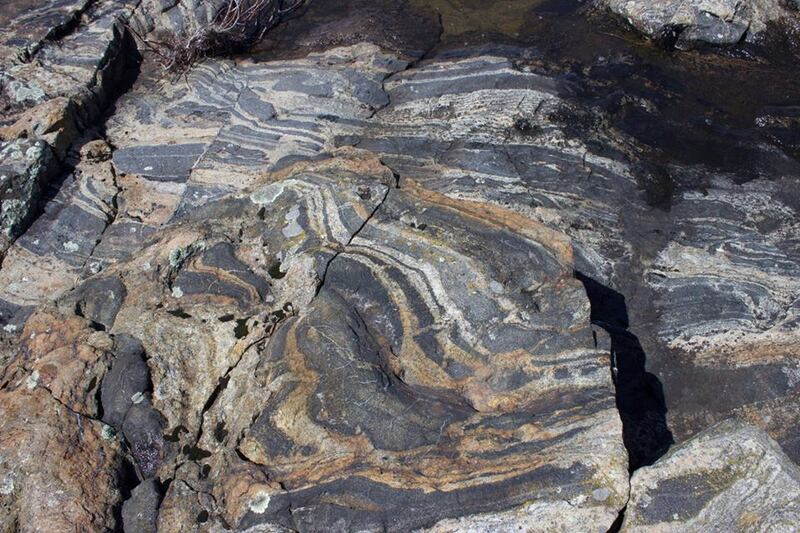 Rocks have these sections or layers because they contain different minerals. 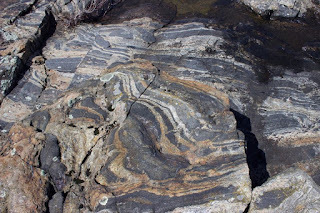 Some minerals found in the rocks around Georgian Bay are quartz, mica, feldspar, and amphibole. Quartz is a hard and shiny and usually white. Feldspar is pink and not as shiny as quartz. Mica is also quite common, it is dark and dull. Amphibole is black and often is the mineral that makes up black sand beaches! Can you see the different layers in the picture below? Which minerals do you think are there? - Twin Points Trail at Killbear Provincial Park. - Rugged Trail, located by the Salt dock in Parry Sound. - Driving the highway 400/69 where the rock has been blasted away to make room for the road! 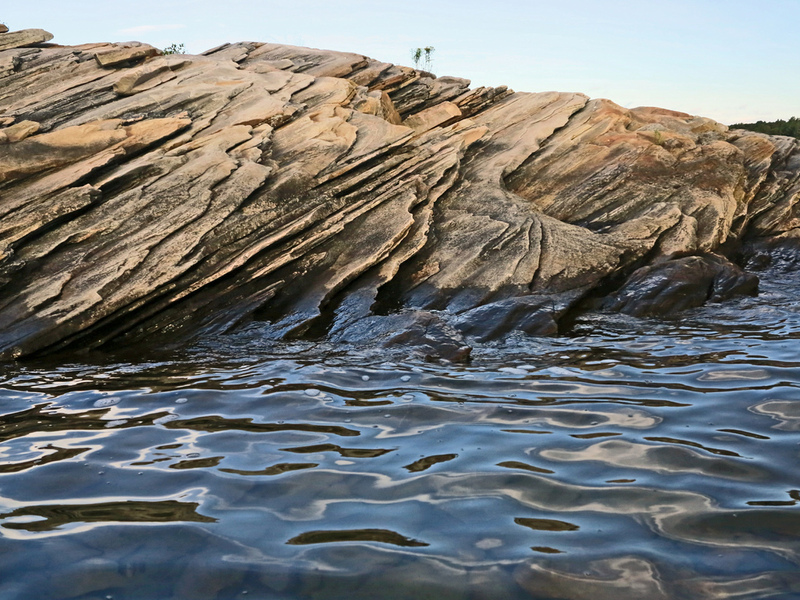 If you know other amazing places to see the features of the Canadian Shield, let us know! Contact kids@gbbr.ca. Dancing Bees and Hotels Please!